The Lagos State Governor, Babatunde Raji Fashola while addressing the Apapa road situation says he wonders why everything is falling into pieces under the Jonathan led administration. 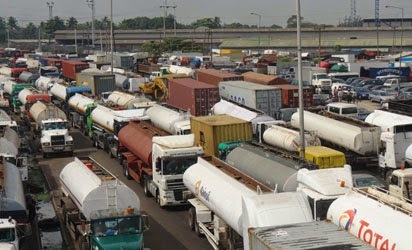 Fashola said the horrific traffic being experienced by business owners and residents of Apapa has continued to inflict untold hardship on them. He says it will also be of note that the Nation is losing in this in terms of revenue. “So, it is lack of management on the part of those managing the port. It is obvious where the problem is emanating from. 90 percent of the fuels used in this country are distributed through this place. ALSO CHECK: The Rooneys Announce the Birth of Their Second Child Klay.